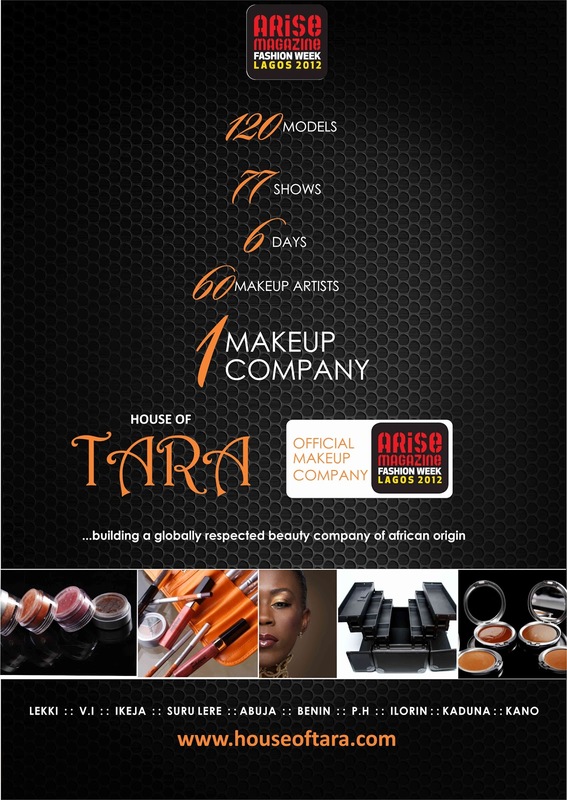 LAGOS, NIGERIA – The organizers of the 2012 Arise Magazine Fashion Week are proud to announce an exclusive partnership with leading Nigerian make-up company, House of Tara. Under the terms of this partnership, House of Tara will act as official make-up company for the 2012 Arise Fashion Week, designing, coordinating and styling make-up looks for the entire runway event. House of Tara Director, Tara Fela-Durotoye confirmed the news and assured would-be guests at the Fashion Week of a spectacular feast for the eyes. “At any fashion show or runway event, the job of the make-up artist is to enhance and amplify the designer’s creations, and to give the audience a fashion-forward, visually titillating experience. At House of Tara, we know all about the art of make-up, but we are also experts at creating an experience using our palettes and brushes. Our work is memorable for all the right reasons,” she added. House of Tara was also the official make-up company to the MTN Lagos Fashion & Design Week which took place in October 2011. Their stunning runway looks and professional demeanour endeared them to the organizers, designers and models alike, engendering a buzz that has remained to date. The Arise Magazine Fashion Week, which is scheduled to run from March 6th to March 11th 2012, will no doubt boost House of Tara’s reputation as Nigeria’s preferred make-up company. I am also glad to say that Barbara & 1923 will be bringing you makeup (and some fashion) tidbits from the backstage ruckus of AMFW so look out for me. Thank you so much. I am glad you enjoyed visiting my site. Be sure to visit back soon.